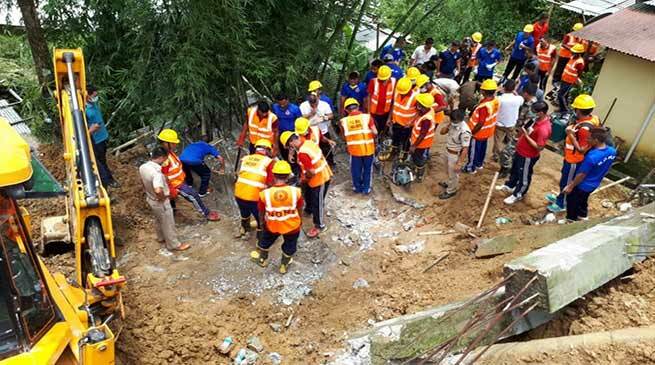 In a tragic incident on Sunday morning, five labourers were killed after the collapse of a retaining wall of an under-construction RCC building here in Itanagar, the capital of Arunachal Pradesh . The victims were reportedly from Biswanath Charali, Assam, and were staying in a labour camp near the retaining wall. Residents informed that four people were actually staying in the camp but a fifth person had also stayed at the camp last night. The incident which took place early Sunday morning at around 6 AM when the retaining wall of under construction building collapse on a labour camp wherein five labourers were staying. SDRF and NDRF was called for speedy rescue operation began at around 8.30 , but bodies retrieved in late evening. DC Prince Dhawan said that the district administration will assist the families of the victims in every way possible and that ex-gratia as per the norms will also be released at the earliest. Dhawan has appealed to the people to take extreme precaution during monsoon and to shift to other safer locations if needed. He informed that they are also asking the residents nearby the incident site to move to a safer location as the NDRF team has informed that the soil is still loose. The DC has also appealed to the people to stop illegal earth cutting which is causing a threat to lives and properties. He added that the district administration is working to stop illegal cuttings but the public should also come forward to support it. SDPO, Itanagar informed that all the bodied have been retrieved from the debris been identified as Pappu Katiya (22), Pappu Gaud (21), Kana Konwar (25), Babloo Telenga (19), and Jiten Telenga (20). All the victims were from Madurali nearby villages of Bishwanath Charali area of Biswanath district of Assam, They were working as labourers for last two months. all the relative members of the deceased have been informed and after registering as case at Itanagar Police Station vide UD Case no-7/2018 u/s-174 CrPc and after conducting formalities the body have been handed over to them for conducting last rite their at their native village. Sikom added.